A "baby" Quattroporte, shown, will compete with the Audi A6, the BMW 5 series and the Mercedes E class. TURIN - Fiat CEO Sergio Marchionne has bold plans for the automaker's Maserati luxury sports car unit: to boost annual sales almost tenfold to 50,000 units from 5,675 last year. Three new models are key to this midterm goal and all are based on systems and components from Chrysler Group. Maserati will introduce two new sedans to replace its Quattroporte flagship model using technology from Chrysler's large sedans such as the Chrysler 300 and the Dodge Avenger. The third new Maserati will be the company's first SUV. Chrysler will build it alongside the Jeep Grand Cherokee in the Jefferson North plant in Detroit. 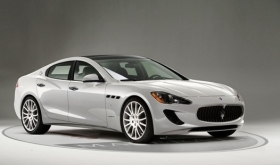 Maserati officials say the new models will not be rebadged Chryslers. They will have different bodies and interiors, as well as new front and rear suspensions and dedicated powertrains. The parts is sharing will be where the customer does not see it, the same as in the Bentley Continental, which is a rebodied Volkswagen Phaeton. 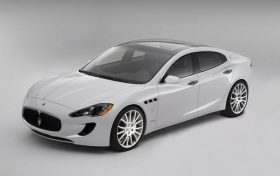 Maserati's two new sedans will be produced at the Officine Automobilistiche Grugliasco (OAG), the new name Fiat gave to the former Carrozzeria Bertone factory it bought in 2009. Maserati will invest 550 million euros ($774 million) to refurbish the plant and launch the models. The sedans will solve the current Quattroporte's size problem. The car is too big to be a compelling driver's car, but too small - particularly in terms of rear legroom - to serve as a good chauffeur's car. The problem will be resolved by offering two cars - a "baby" Quattroporte, code-named M157 and a larger Quattroporte, code-named M156. The "baby" Quattroporte will launch next year and is designed to be a driver's car and compete with rivals such as the Audi A6, the BMW 5 series and the Mercedes E class. The project was initially conceived as a flagship model for the Alfa Romeo brand, but was switched to Maserati because this brand could win a higher pricing point and already has a global distribution network. The new model keeps Maserati's traditional layout of a front longitudinal engine and rear-wheel drive. The car will use a heavily revised, high performance version of the Chrysler V-6 Pentastar engine. With capacity reduced to 3.0-liter, the addition of Fiat's fuel-saving MultiAir air management system, twin turbocharging and direct injection, this variant will deliver over 400-hp and good fuel economy. The most powerful version of the 3.6-liter Pentastar currently delivers 305hp on the Dodge Challenger. The "baby" Maserati, shown, was initially conceived as a flagship model for Alfa Romeo. Europe would also get a diesel variant of the baby Quattroporte with a beefed-up version of VM Motori's 3.0-liter V-6 engine currently offered on the Jeep Grand Cherokee for export. Maserati says the new car will fit a price range between 55,000 euros to 70,000 euros in Europe ($78,000 to $99,000). The large Quattroporte will be considerably bigger than the current model to compete better with chauffeur-driven, long-wheelbase versions of German flagship sedans such as the Audi A8, BMW 7 series and Mercedes Benz S class. With overall length at about 5170mm, the new model would be 70mm longer than the current Quattroporte and 220mm longer than the "baby" Quattroporte. Maserati's new flagship will use a revised version of the Ferrari-built 4.7-liter V-8, switching to direct injection and delivering about 475hp, coupled with ZF Group's eight-speed automatic transmission. This sporty, fuel-saving transmission is already available on large Audi and BMW models, while Chrysler will begin offering it on the 2012 model year on the 300 large sedan and its Dodge Charger sibling. Maserati will add all-wheel-drive and stop-start technology, aiming to reduce fuel consumption by 25 percent from the current Quattroporte. Maserati said the new Quattroporte should increase the brand's share in the global superluxury sedan segment to 8 percent from the current 3 percent. The company counts superluxury sedans as models priced between 125,000 euros and 150,000 euros in Europe. The sedans will account for about 30,000 to 35,000 units of Maserati's 50,000 annual sales target and the SUV for about 10,000 to 15,000. The remaining 5,000 units would come from Maserati's current core products, the GranTurismo coupe and the GranCabrio convertible. The new Maseratis were designed by the Maserati Styling Center in Turin, under the direction of Marco Tencone and the supervision if Fiat group design supremo Lorenzo Ramaciotti. For the past two decades, Maseratis have been styled either by Italdesign Giugiaro S.p.A. or Pininfarina S.p.A.
Maserati will debut a concept at the Frankfurt auto show in September that hints at its Jeep Grand Cherokee-based large SUV set to hit the market in 2013. The Maserati variant features specific body panels and a new interior. The engine would be Maserati's 4.7-liter V-8 unit capable of about 450-hp, coupled with ZF's eight-speed automatic transmission. Possibly only for Europe, the Maserati SUV could also get a diesel variant using VM Motori's 3.0-liter V-6, with power increased to over 300hp from 241-hp the engine currently delivers on the Grand Cherokee exported to Europe. Maserati declined to give a price target for its large SUV, but in Europe it would cost considerably more than the Jeep Grand Cherokee 5.7-liter V-8 Overland that in Italy starts at 63,800 euros.